In the spring of 2016 I did an internship at the Patrician Patronage Project in Florence. It was a wonderful time in which I researched the patronage of the Soderini family of the period 1530-1670. Nowadays, the Soderini family is not one of the most famous patrician families of Florence. Some descendants, however, made their way into the history books. Well-known, for example, are Piero Soderini (1450-1522), who was the gonfaloniere a vita of the Florentine Republic from 1503 until the Medici returned in 1512, and his brother Cardinal Francesco Soderini (1453-1524). There is not much known about the Soderini in the sixteenth and seventeenth century and not much is left of their patronage. Therefore, it was really exciting when I did encounter the little physical ‘evidence’ still visible in Florence. To me the most special artistic commission of the Soderini family that has remained was the bust of Jupiter by Giambologna in the Boboli Gardens in Florence (behind Palazzo Pitti). This enormous bust was commissioned by Giovanvettorio Soderini (1526-1579), probably in 1560. It was placed in the garden of Giovanvettorio's villa Il Giardino at San Salvi, Florence. Later, the work of art came into the possession of the Martelli family, and eventually in the collection of the Medici. Since 1757 it has had its place in the Boboli Gardens, so of course I went to see it. After a search of more than an hour with a temperature of more than 30 degrees Celsius, there it was: a more than two meters high bust of Jupiter. At the end of an aisle, beautifully accentuated by the two hedges. The head of Jupiter turns slightly to the right and has curly hair and a curly beard. A belt runs across the muscular chest. It was so great to finally see physical evidence of the patronage of Giovanvettorio, I was literally jumping up and down from joy. Even though there is no reference to the Soderini on the sign on the pedestal, a branch grew in front of Jupiter’s head and no one seemed to be interested in the statue, to me it was like a relic (as you can see in the picture). There are more references to the Soderini to be found in Florence. One of them is located at the Piazza del Duomo. Above the entrance of the Museo del Duomo is a bust of Cosimo I de’ Medici by Giovanni Bandini (1540-1599), made circa 1572. Although this particular bust was not commissioned by the Soderini, they did commission a similar one by the same artist. The bust at the Piazza del Duomo is one of five comparable busts made by Bandini around the same time, the others were commissioned by the Minerbetti, the Gaddi, the Niccolini and Bernardo Soderini. Only the busts made for the Niccolini and for Bernardo Soderini were placed indoors. Another remaining example of the five busts can be found in the Detroit Institute of Arts. Giovanni Bandini, Bust of Cosimo I, 1572, Detroit Institute of Arts, Detroit. This statue could have been the one that either the Soderini or the Niccolini commissioned from Bandini, or so the museum claims based on the excellent condition of the statue. 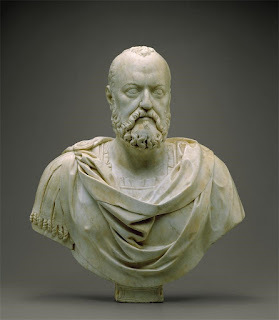 The bust shows an aged man with receding hair and a full but short beard. His head is slightly turned to the left. The wrinkles around the eyes, the receding hairline and the sunken cheeks with a wart make the bust a realistic portrait. At the same time, it seems idealized and classicized: Cosimo is depicted as a wise and powerful Roman military hero, wearing a sixteenth-century interpretation of a paludamentum (a cloak worn by Roman military commanders), draped over a cuirass. To me it is an impressive bust and although it is technically not commissioned by the Soderini, I often made a small detour just to look at it for a little while. A third piece of evidence of the Soderini patronage in Florence is at Castello di Gabbiano in Mercatale Val di Pesa. 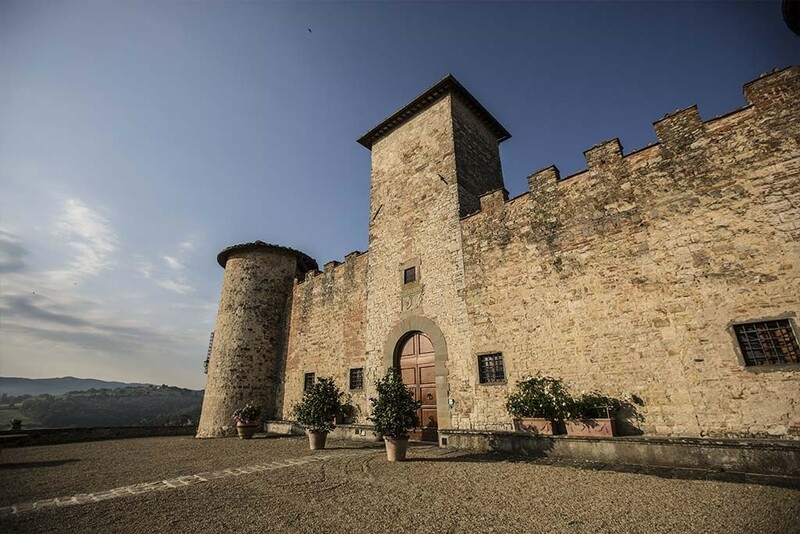 Castello di Gabbiano is a beautiful castle on the top of a hill, surrounded by vineyards and nowadays used as a hotel and winery. 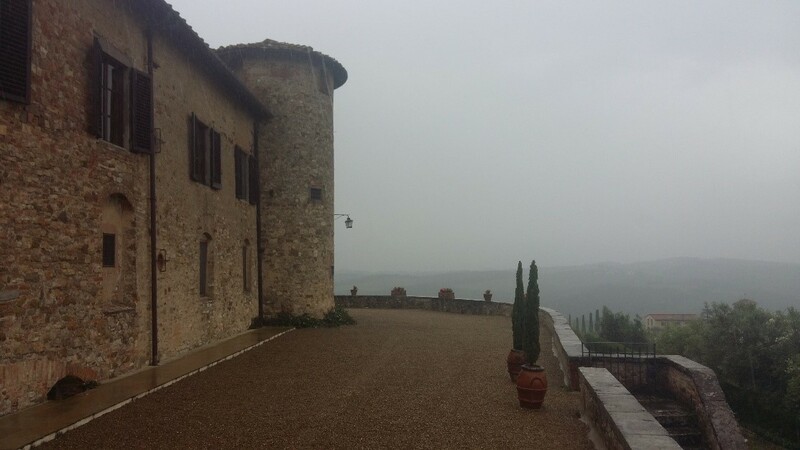 Lorenzo di Tommaso Soderini bought Castello di Gabbiano circa mid-fifteenth century and the family owned it until the nineteenth century. The evidence of the Soderini-history of the castle is represented by two coats of arms of the Soderini (three stag heads) on the outside wall, above a doorway. One contains a double-headed eagle and one the papal keys to represent the Soderini branch of Niccolò (with the brothers Piero, gonfaloniere a vita, Cardinal Francesco and Giovanvettorio) as well as the branch of his brother Tommaso Soderini (with Bernardo and the man responsible for the placement of the coats of arms). 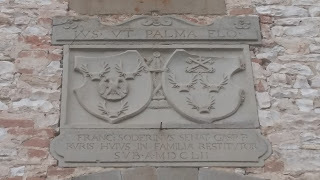 Beneath the coats of arms is an inscription in which senator Francesco di Gaspare Soderini presents himself as the restorer of the building: ‘Franc. Soderinus senat. Gasp. F. Ruris Huius in familia restitutor Sub. A MDCLII’. 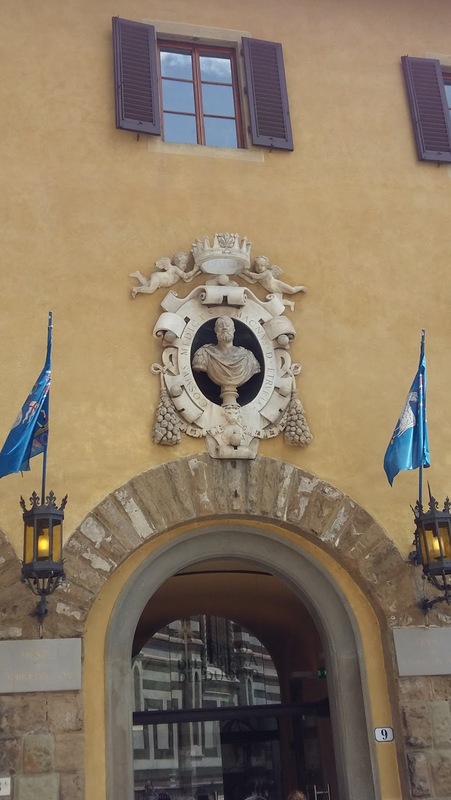 Above the coats of arms is the motto of Piero Soderini: ‘Ius. 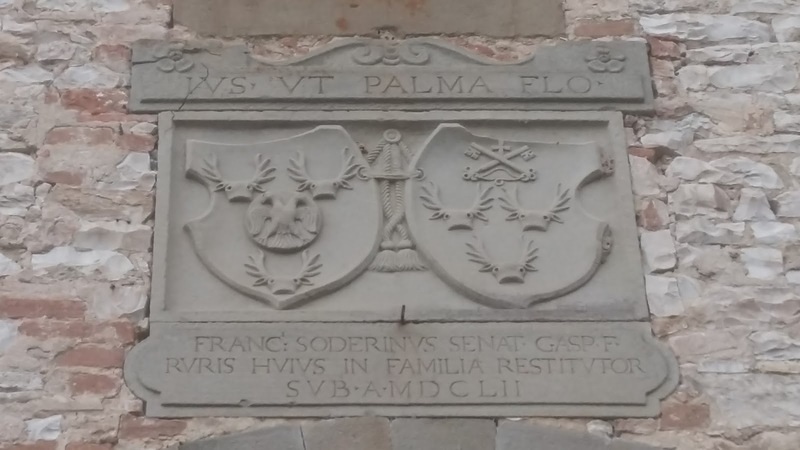 Ut palma flo' (Iustus ut palma florebit: “The righteous shall flourish like a palm-tree”, psalm 91:13 Vulgate). So, senator Francesco Soderini owned the castello in 1562 and was clearly very proud of the anti-Medici history of his family, considering the reference to the most famous anti-Medici family member of the Soderini, Piero Soderini. Seeing this ‘evidence’ of the patronage of the Soderini proved to me how important the on-site research is in addition to library and archival research. It gives inspiration, confirmation, new insights and, of course, it is fun. Sometimes it is with a temperature of 30 degrees Celsius (as during my search in the Boboli gardens), other times it is in the pouring rain (as when I visited Castello di Gabbiano), but it always adds something to your understanding of the location and the specific work of art. It is a priceless experience. See also the stories of PPP-interns Charley and Lara!